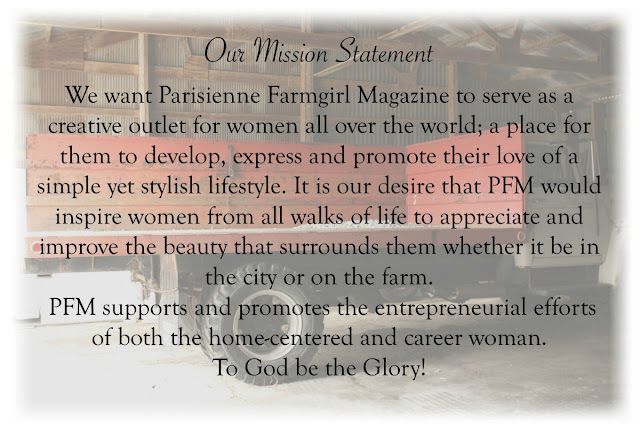 FarmgirlCyn: Parisienne Farmgirl Magazine Giveaway! I am thrilled beyond to be able to offer my readers a chance to win a years subscription to a brand new, online magazine from my dear friend Angela, of Parisienne Farmgirl fame. I have known Ang since she was about 12 years old. Her mama Joy (savvy city farmer) is one of my very bestest friends EVER. We attended Ang and Joel's wedding. I have been invited to her parties. We've gone out dining and dancing. I've eaten at her table. Laughed together till we cried. Admired her love for God and family. And YOU, my dear friends, get a chance to win a one year subscription! 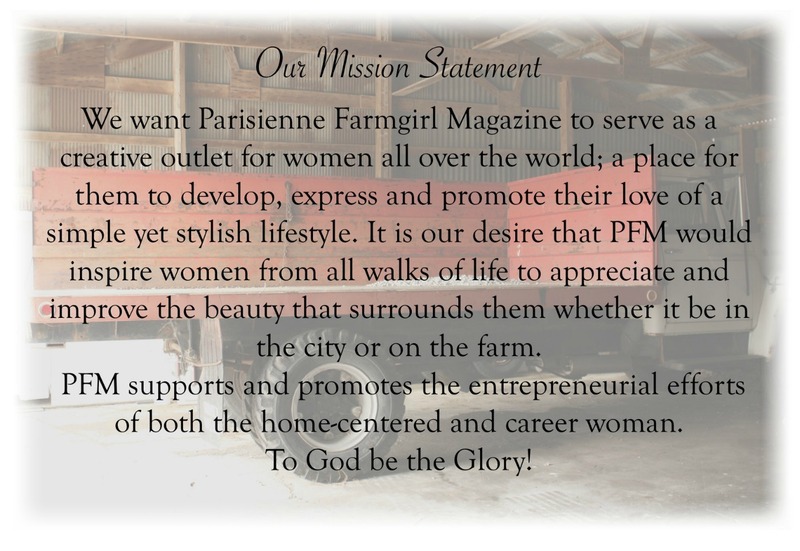 Parisienne Farmgirl Magazine will arrive in you e-mail box quarterly, starting with the first issue on April 1, 2012. This, my friends, is a $24.95 value! And...if you have already subscribed and you are the winner, Angela will immediately refund your subscription price. There will be recipes, gardening tips, fashion, DIY projects, farm living, etc. Ooh...and once the dust settles around here, Ang asked if I would be willing to submit some of my recipes for future editions. All you need to do to enter is leave a comment here stating why you would love to be the winner! the first day of spring! and how exciting to be in on the very first edition! I hope that you get lots of business from your ad and that things are going well for you. Spring is springing around here and that wonderful sun always makes me feel good....hope it does for you as well! Oh my goodness! Was so happy to hear Ang is going to have a magazine! Feel like I know her thru your and Ang from Maple Valley Farm's blogs. Am excited to read her magazine and hope I am the lucky winner. I've been following her blog for awhile now. I love her ideas and attitude! 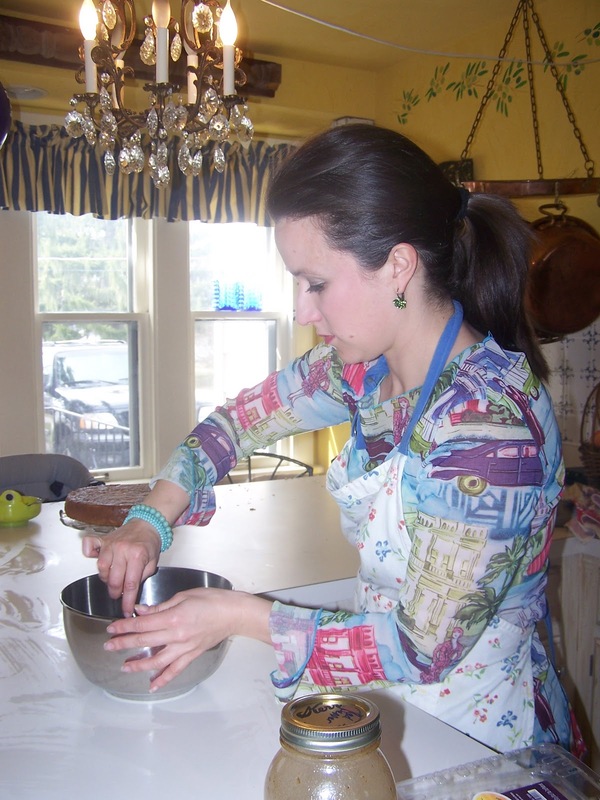 Love her sewing, her recipes, her garden and she has the most charming family! Her magazine sounds delightful, as well! I would love to win a years subscription. April is my birthday month ~ it would make a great gift for me! And I would love to read your article, too, Cindy! How fun is that?! Very exciting!! Congratulations on being in the premier edition! God is good...all the time! I would love to receive her magazine! I have been hearing about this for a long time and the only for me to see this is if I win. We're losing a job this year with the breadwinner so we are cutting way down. No extras for us anymore. I love a good, new refreshing magazine and this sounds like just the ticket! Congrats! This is one giveaway I would love, love, love to win! The magazine sounds wonderful! Congrats to Ang on the publication of her very own magazine! I would love to win a subscription, of course. Be Farmgirl daughter at Mother's Day. Glad things are going well for you again Cyn!! This sounds like an interesting and inspiring magazine and it would be nice to be the winner. It's good to see you again dear Cindy. How wonderful! And I love that entrepreneur spirit! I would greatly appreciate winning this terrific prize! How very exciting! I would love to be able to read the new magazine. I am sure it would inspire me! I love her blog and yours and would LOVE to have this magazine! I would love to win because I am interested in a simple yet sophisticated lifestyle. Thanks for the chance! How exciting it would be to win a subscription to Ang's new magazine. How exciting is this new adventure of hers, and that you get to participate. I am always looking for inspiration for all that this magazine has to offer...anything that would help me to be a better homemaker. First, before I say why I'd love to win, I must tell you that I surely see God's hand of blessing in this for you. I see it as a creative way He is answering prayers prayed. I know He wants us to "expect more." Yes! Now for me, yes, I would love to win the subscription. I love the simplicity of combining French inspiration with farm life and would love to learn more. Thank you for including in in your drawing. I haven't checked in for a while, and I'm so excited for your excitement! 2) Provide a mental respite that this mom of three littles would not otherwise have access to.. The healing music on your blog ministers to (the fragments of) my heart. Glad things are looking up. Just dropped by to say hello. This sounds wonderful! My daughter told me about this magazine, Cindy. I am so thrilled that you will be able to build your little business via Parisienne Farmgirl. Whether a winner or not....when I can afford to I'll subscribe. How exciting!! It would be great to be the winner of this! My fingers are crossed, but I don't usually win things. I will have to check out her blog! Hugs!!! I love both giveaways and magazines. I especially love to be blessed by the combination of the two! Thank you for the opportunity to play in your wonderful giveaway! I would love, love, love to be chosen! I live in the suburbs and there are very few homesteaders/farmgirls. This would be a great chance to get ideas from others! Great giveaway Cindy! ME!! Pick me!! you know i would LOVE this!! I think this is exciting! Starting something new to help others find their creative side. Great ideas and wonderful people. Would love to be a part of this endeavor! this looks like a great magazine - can't wait to get a copy! oh =( just found out about this via FB post. off to see more of your site, and find our more about magazine.